We now are preparing to say Goodbye to Central Lakeview and several blocks of iconic Clark Street – and Hello to blocks of empty, useless lots with overhead cement – all to ‘fix’ a 40-second delay occurring on only 40% of CTA Red Line trips downtown. This seems a good time to revisit what happened to a huge area of Chicago – thriving businesses, residents and all – so they could create the charming, ugly, gridlocked Eisenhower Expressway. Moved In, Who Was Forced Out? While much of the country was losing its collective mind over the prospect of a President Trump, Chicago’s City Council unanimously passed Mayor Emanuel’s budget. After the November 16 vote, the mayor and aldermen congratulated themselves for not raising property taxes in next year’s budget, at least not over and above the millions they’d raised earlier in the year. Meanwhile, another proposal was swiftly flying through a separate approval process. And this one amounts to a $625 million property tax increase the mayor plans to use to rebuild portions of the Red and Purple Lines and construct the Belmont Flyover (which would allow the Brown Line to bypass Red Line tracks as it pulls into the Belmont station). So how can the mayor and aldermen say they’re not raising property taxes when actually they’re about to do just that? Against the Flyover? Speak Up Wednesday, Nov. 16! Here’s our last chance to stop the CTA from raising our taxes and using our money to destroy Central Lakeview with their unnecessary “signature project” brown line Flyover. Recommend approval of the redevelopment plan for the proposed Red and Purple Modernization Phase One Project Tax Increment Financing Redevelopment Project Area, recommend designation of the area as a Tax Increment Financing Redevelopment Project Area, and recommend adoption of Tax Increment Financing for the area. Transit TIF Hearing – Please Attend! Who should attend? All residents, property owners, taxpayers, anyone who cares about the future of Lakeview. Transit TIF? The City of Chicago proposes to pay its share of funding for the CTA’s RPM (Red-Purple Line Modernization) Plan by creating a special TIF tax district of all the land within 1/2 mile in either direction along the Red Line tracks from Devon Ave. to Division St. So, your property tax dollars will be used to gut Central Lakeview and erect their silly “Signature Project” Belmont Flyover. What does this mean? Why should you care? Then, come to the meeting. Participate. 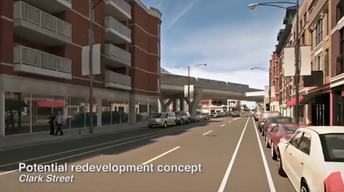 Clark Street in Lakeview with planned TIF-funded Flyover. Mayor Emanuel and the CTA have approval for their Transit TIF funding. Now watch them waste millions on an unnecessary and neighborhood-crushing project. The idea is that residents and businesses near CTA lines will benefit from the modernization of the rail system, so property values will rise. Projected property tax revenue increases become TIF funding used to fund needed improvements to aging CTA stations, rails, and supports. Makes sense generally. But in Central Lakeview, just the opposite is true. Here, the CTA plans to build what it has called a “Signature Project,” a $570+million Brown Line “Flyover” just north of the Belmont station. It means constructing a Jane Byrne interchange-style curvy skyway in the middle of Lakeview. The purpose is to lift the Brown Line tracks up and over the Red Line tracks to shave a mere 20-30 seconds off 40% of Red Line trips downtown. To do this, they plan to tear down 16-21 buildings, many right on historic Clark Street. Putting a railway in the sky above the heart of this thriving entertainment-theater-restaurant district will turn much of this popular neighborhood into a permanent under-El wasteland. Increased property values? Just the opposite. Artistic renderings of a post-Flyover Central Lakeview the CTA has presented are filled with fanciful buildings that couldn’t possibly fit on the lots left after construction. Lovely to look at, but not at all related to the ugly, empty future we will face. Who cares? Everyone should. It’s our money they will waste, a part of our city they will strip of its character and charm. Before the Mayor and the CTA waste $570+ million to destroy Central Lakeview for this “Signature Project” Flyover, they should consider: Who will want to put their signature on this? Who will want their name on the Belmont Flyover in 10 years when Central Lakeview – a major restaurant, theater, entertainment district – has been gutted? Who will want their name on this curving ride up and over other elevated tracks after 20 years of what would most assuredly be poor maintenance? And isn’t there something sickeningly familiar about this new “Signature Project”? Remember all the excitement and rush to create the “Super Station” under Block 37? Now we have a cavernous hole deep under Block 37 – a $400 million Super Station that connects to nothing, and we’ll be paying for it for years. How about the bold O’Hare Express plan – happily now on hold – to construct a second Blue Line track high above the existing Blue Line, to create a thrillingly expensive, exclusive, super-fast ride to O’Hare for executives? Let’s stop and think this time. Let’s not rush to ruin Central Lakeview with another dramatic, expensive idea we are bound to regret. Instead, focus Transit TIF funding where it’s desperately needed – updating tracks and stations and expanding CTA service to reach more neighborhoods all around Chicago. No more “Signature Projects,” please.